A beautiful, tranquil city famed for its spectacular coastal beauty, Victoria is home to a fantastic network of trails just waiting to be explored by you and your dog! 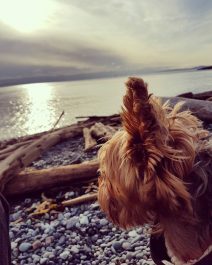 With numerous attractions and dog-friendly amenities along the Victoria waterfront, B.C.’s capital is a wonderland for curious canines and their owners. 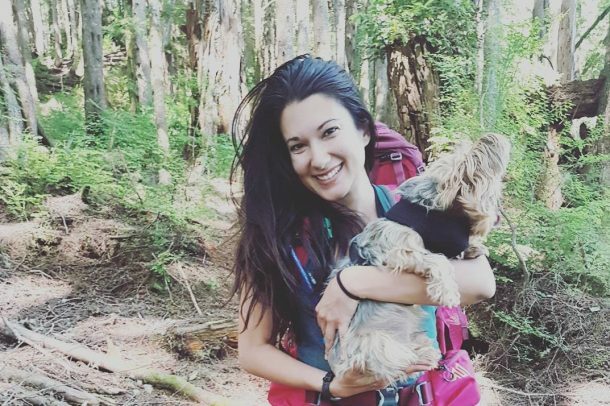 For this one-day journey in B.C.’s capital, we recommend bringing along snacks, water and a portable bowl for you and your pet. Begin your walk at Clover Point Dog Park, an off-leash green space along the Trail in Victoria. This popular park was named for the acres of red clover that were found growing nearby when the Hudson’s Bay Company landed here in 1842, on the traditional land of the Lekwungen and Songhees First Nation territory. The camas and clovers still found in this area today were a valuable food source for the communities who lived here. 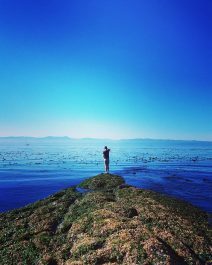 Take your dog off their leash for a while as you walk through this beautiful ocean area – you can choose to walk up on the concrete sidewalk above the coastal bluff, or down along the ocean. Either way this section is all an off leash dog park! Here you will see not only see not only birds surfing the wind off the bluffs and sea, but people too! Enjoy the spectacle of parasailers dancing above the cliffs, and wind surfers coasting near the shore. 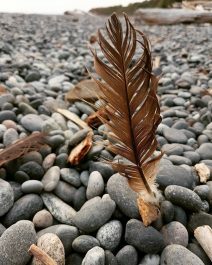 As you approach Beacon Hill Park, take some time to explore your surroundings. If you turn left, you could walk to Spiral Beach, a peaceful hideaway for you and your pooch. To your right, across Dallas road, you’ll find the Story Pole, one of the tallest totem poles in the world carved by a team led by Chief Mungo Martin, Kwakiutl tribal chief and renowned wood sculptor. At the intersection with Douglas Street, put your dog back on their leash and continue along the Trail. To your right in Beacon Hill Park, you’ll find the Mile Zero Monument, which marks the westernmost point of The Great Trail’s 24,000 kilometres of trail! Feeling hungry? Take a break in Holland Point Park. This area affords spectacular views of the sandy dunes and sea views, and is an ideal spot for chowing down on a CLIF bar or some kibble, and taking that perfect photo for Instagram. You can also check out the Harrison Yacht Pond – specifically designed for free-sailing model sailboats. In need of a caffeine boost? Get a to-go coffee from Breakwater Café and Bistro near Ogden Point – but don’t keep your dog waiting too long outside! 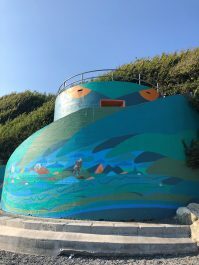 As you return to the Trail at Ogden Point, you’ll notice a colourful mural on the nearby breakwater. The artwork is called Na ‘Tsa Maht, or the Unity Wall Mural, and uses cultural motifs of the Coast Salish Nations to depict the importance of interactions between Indigenous communities and settlers. The mural was painted by teams of six youth, who were mentored by local Indigenous artists. The mural is a striking addition to Victoria’s cityscape, which is on the traditional territory of the Songhees and Esquimalt Nations. Continue along the Trail on Dallas Road to Fisherman’s Wharf Park, and stop for a quick snack and refreshments for your furry friend. If you’re need something a little more filling, visit Barb’s Fish and Chips, a dog-friendly and unpretentious restaurant serving the freshest catch of the day. Keep walking to Laurel Point, where you will find yourself on David Foster Way. Named after the music producer and TCT Champion who helped fund it, this Trail section offers wonderful views of Victoria’s historic marina. Once you reach the facade of the Fairmont Empress Hotel, take a moment to appreciate how far you and your dog have walked. End your journey here, and reward your canine companion with a post-Trail treat! Fly to Victoria Airport (YYJ) with Air Canada or WestJet from multiple locations in Canada. Stay at the Fairmont Empress for a luxurious old-world stay in Victoria. This pet-friendly hotel is one of Victoria’s most iconic landmarks, and is an ideal location for you and your pet. Read more about their pet policy here.